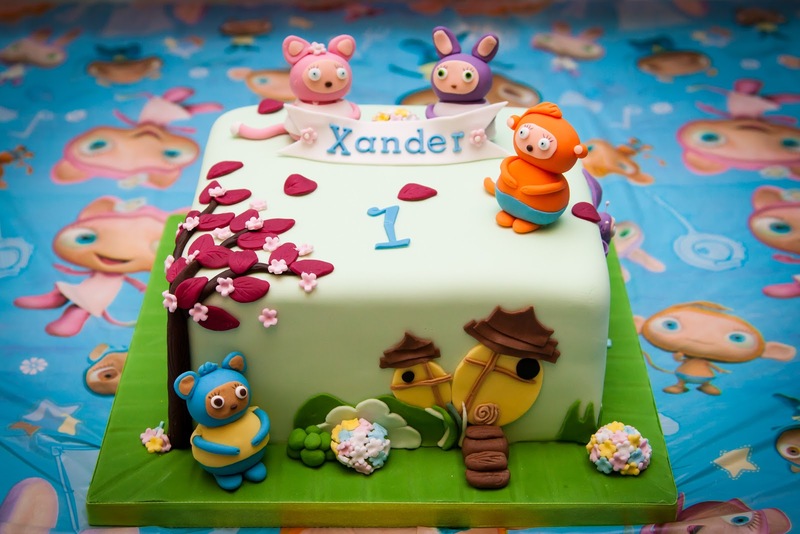 Its been a while since I've written a little Xander growing up blog, so as we're nearing the end of 2012 I thought now would be a good time to update with what he has been up to since his birthday. Where to begin? I've made a list! This week I've spent time sorting out his 12-18 month clothes ready to start phasing them in over the next few weeks. His 9-12 months has lasted him well and been worn for the longest so far, but he's had a little growth spurt recently and the arms are getting too short. Not the legs though; Xander clearly has little legs like his Mummy's side of the family! We also think he might be an emergent lefty like his Mummy, as he seems to be predominantly playing or picking things up with his left hand at the moment. Alexander now has a total of 6 teeth. Cutting another two in October and the sixth tooth just over a week ago. He is still full of dribble and we're getting through bibs like nobodies business so I'll continue to blame teething for the time being; he could do with some more bottom teeth! The poor baby had a very rough week during October half term when he cut the two teeth while being very poorly at the time. It was the week after his MMR vaccination and I've never known him so under the weather. Full of cold symptoms, projectile vomiting, loose nappies, fever, temperature, completely off his his milk and food which is completely unlike him. For a few days the only thing I could get him to eat was little fruit pots. To make matters worse we were away on a cold 'up North' holiday in Crimdon Dene, in a caravan without decent heating or washing machine. Nightmare! Up until two weeks ago Alexander was still breastfeeding morning and bedtime. A fortnight ago we mutually decided it was time to drop the morning feed so now at 14 and a half months old he is down to one feed a day, to go to bed. Never would I have thought I would have still been feeding him now. When I look back to how I felt about breastfeeding this time last year, to still be feeding now is quite astounding for me. By the time he was 6 months old I knew I wanted to aim to feed him until his birthday, his birthday came and went two months and a half ago and we're still feeding. For now it is firmly part of his bedtime routine and he still often feeds to sleep, so for the time being we'll keep going with it; it feels somehow wrong right now to take something away that he obviously finds comforting and sleep inducing, besides he hasn't stopped being a baby simply because he is a little over one now. At the moment I think my 'upper limit' is 18 months, I had no plans to become an extended breast feeder, and I don't think that is something I want, as much as I enjoy that quiet time with my boy at the end of the day. 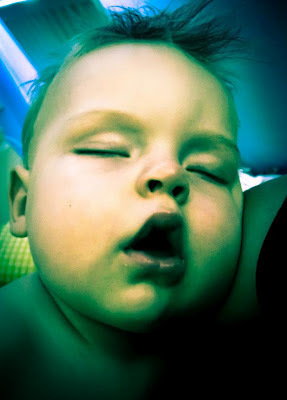 For me 18 months is when he becomes a proper toddler and time for us to move on from breast feeding to sleep. He is such a grown up little boy in many ways now, but in others still very much baby like. He's in a transition stage now between baby and nearly toddler. Absolutely gorgeous in every way though. He is so cheerful and cheeky, an amusing and loving little boy. If you ask Alexander for a kiss or cuddle now he will throw himself at you, burying his face in you going 'Awww'. He gives the best cuddles spontaneously too, to us and to Fiz, and is so genuinely affectionate and loving. Love that boy so much! He has learnt the names of more familiar people now and will look at Daddy, Mummy, Fiz, Bampi and Nana when asked where they are. 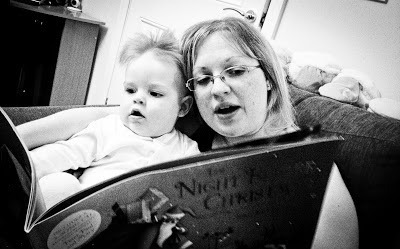 For Christmas we have bought him a talking photo book we hope will encourage him to start saying our names too. In the last few weeks we have had one definite and meaningful Da-eee and one definite meaningful Mum-ma. Typically he hasn't attempted it again since, but hearing him call for both of us was heart melting. One Saturday morning we were all in bed have morning snuggles. Jon got up to go to the toilet and when he came back, Xander looked straight towards him, so excited and exclaimed Da-eee. For me is was more a whiny Mum-ma because I was in the kitchen; he was reaching through the gates towards me, calling me to pick him up, but still, it was still heart melting. I picked him up and smothered him in kisses! His understanding of language and identifying objects is improving all of the time. He seems to have generalised that a phone is a phone, and whether it be a toy phone, or one of our mobiles he will now pick it up and put it straight to his ear and say 'uh'. It is so cute! We're trying to get him to say Hiya into the phone. He is such a techy baby as he loves Facetiming Daddy! He loves singing and his current favourite songs are 'Horsey Horsey' when he is on his rocking horse and he'll join in by rocking back and fore, 'Twinkle Twinkle' and he'll join in my twinkling his little hands, 'This is the way the lady rides' and he'll join in at the end by anticipating and throwing himself backwards when the old man falls in the ditch, and 'If You're Happy and You Know It Clap Your Hands', and obviously he joins in by clapping his hands. I know he was late clapping his hands and waving bye bye but I was so proud and excited when he joined in clapping games and started waving bye bye when we asked him to just over a month ago when he was 13 and a half months old. Alexander is a speedy little crawler and quite the escape artist if he spots an open door! We've had to put a gate up across the kitchen because he had become such a terror with crawling everywhere he shouldn't be and I was worried he was going to burn himself or fall over on the tiles as he was obsessed with climbing up the washing machine. I think we still have a while to go until Alexander is walking but I'm not at all worried. I know he'll do it when he is ready. I think it is just a case of confidence now and a little bit more development on balance. His cruising and physical skills are all otherwise fine. He is climbing up and over and on everything now! Alexander will walk for quite a way just holding onto one of our fingers but isn't ready to let go! If you let him go he lowers himself down to his bottom. He is very occasionally standing unaided for a few seconds so I'm sure it won't be too much longer now before he stands independently properly. Nursery reports weekly about how socially confident he is. I love that he is making friends and enjoying so many new experiences there. He seems to have buddied up with another little boy in his room and the staff tell me they make a mischeivious little pair. Wherever the one goes, the other follows and they empty toys baskets and drawers around the room in tandem. 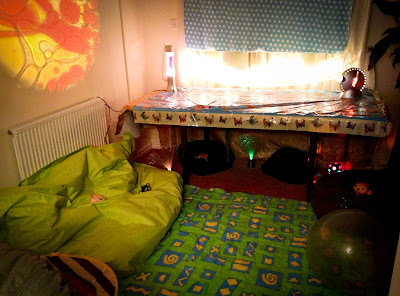 Today there was only a few children in Nursery (yes, bad Mummy, its the holidays and I still sent him. In my defense I had to do some work on my assignment which is next to impossible with him at home!) so all the rooms joined together and the babies were with the older children. Alexander wasn't at all phased, when I went to pick him up he was one of the youngest children in the room, big boys and girls playing all around him, him looking tiny in the thick of it but playing amongst them. I love that he has such confidence already. I'm so very proud of him. A week Friday he officially moves up to the older babies room and I think he's going to be just fine with his continuing nursery adventure. He has been so spoilt again this Christmas. He still has six presents to open! 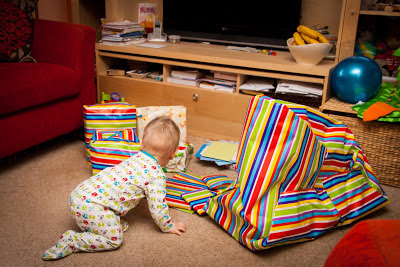 He's been so appreciative of each gift, taking his time, enjoying unwrapping them, desperate to play with the new treasure inside. Impatient that Daddy isn't getting the box off quick enough and then completely immersed discovering the new game. It's so lovely to watch him play! If we've dared offer him another present to open while he is still engrossed in the previous one he's pushed the wrapped present away and frowned at us as if to say 'but I'm still playing with this one.' I love that each gift has been loved by him. I think I'll be a little sad the year that magic wears off and the name of the game becomes ripping all the wrapping paper off in one go and presents are finished before dinner time. Our house currently resembles a toy shop again, we have a lot of tidying away and sorting of old baby-ish toys to do to make room for his new older baby toys, but it is safe to say Alexander seems to be developing a real love of cars and books. He is going to need a new little toy box just for his cars before long, he pushes the cars around the floor making a 'brrr' noise; what a typical boy. I love it! Nature or nurture I wonder? Well I think that just about brings us up to date for now. He has grown so much this year, our still tiny newborn baby last Christmas, and our nearly toddler baby this Christmas. I'm so looking forward to all the new things he's going to do in 2013 too. Wishing you all a blessed and peaceful New Year, and sending love from all the Morgan's. The low hit earlier than expected. Last year I hit the low on Boxing Day, after the main day had been done. This year, I hit the low Christmas Day night. Christmas Day had been lovely, hectic, but lovely. But somewhere after everyone had gone home I felt that overwhelming hurt that our little girl had been missing again, always missing. 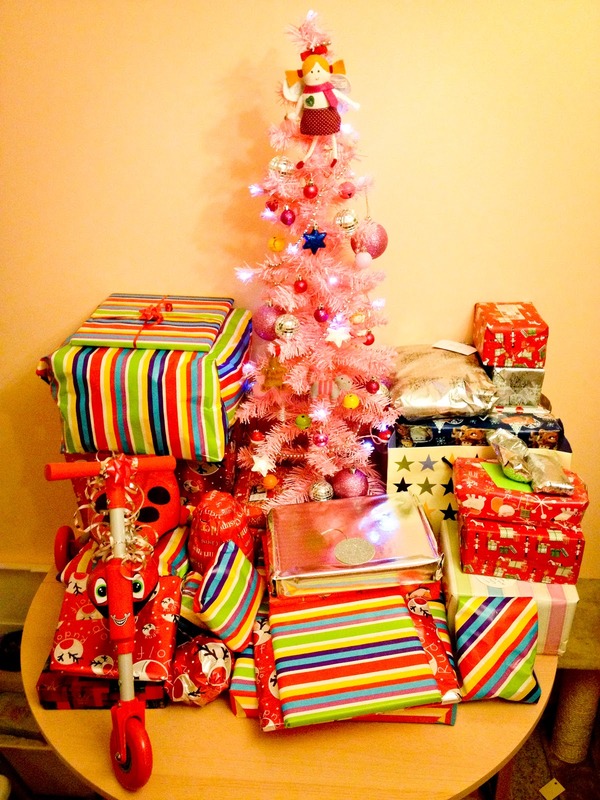 Overwhelming sadness that we hadn't done enough for her or her brother this Christmas. Irrational I know. We'd had precious family time in her garden, our quiet moment of the day, but sometimes nothing feels enough, because nothing fixes the pain. Somewhere in all the busy-ness Jon and I hadn't found that quiet moment at dinner to pull Anabelle's cracker, a moment missed. Then somewhere in all the busy-ness Jon and I hadn't found that quiet moment, just with our son to open his main present. And these two things were the trigger to streaming tears for another Christmas. So Christmas Day; quite lovely, Christmas night; pretty diabolical. Bet lets focus on the lovely. 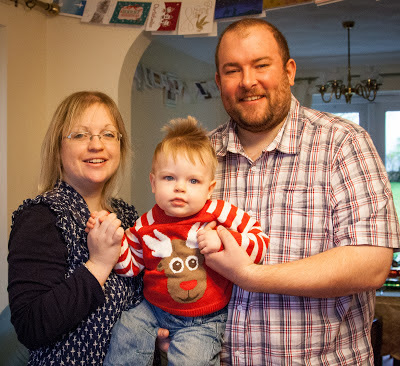 Our little family Christmas 2012. 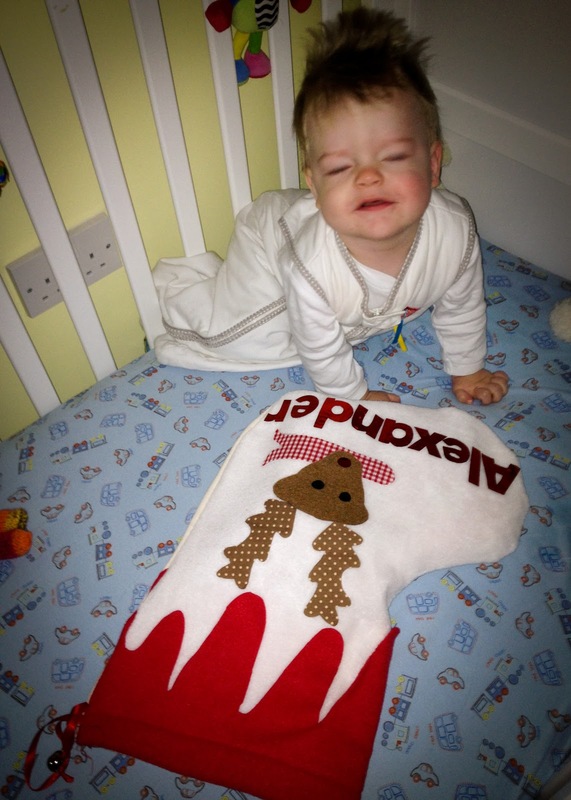 Xander was mesmerised by the sparkling reindeer dust outside before he went to bed, enjoyed cuddling up for 'The Night Before Christmas', he slept so well that come 7:30am we had to wake him up to tell him Father Christmas had been. He was simply delightful all day, as he always is. 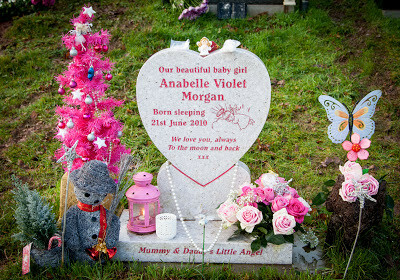 We visited Anabelle and took her presents to her, Belle as spoilt as her brother and remembered by so many. We are always so touched and grateful when friends and family take the time to remember our two children. Xander helped to open one of her presents, a present for her to him. A bell for Belle to remind him of his sister. Here we are two days later and Xander is still opening presents! Completely spoilt baby! 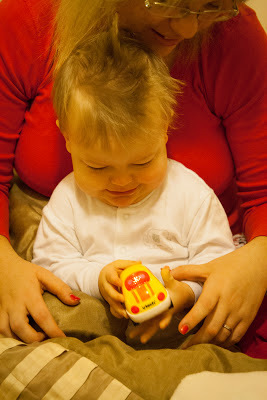 He has loved everything he has opened and really appreciating each new toy. He is so desperate to explore them and very impatient waiting for Daddy to get them out of the packaging! And if you offer him a new present to unwrap while he's still engrossed in the previous one it gets pushed away until he is ready! His favourite presents so far have been his Happyland Farm and Toot Toot cars, but everything really, he's just loved everything! And we love him. For all the pain in our lives our beautiful son brings more joy and is more precious than he could ever know. Jon thinks I need to go back to counselling. Hurt and grief and missing her now so consuming again he is concerned. We're in different places. He has reached acceptance; I'm a million miles from there. I'm not sure I want to, or can, ever accept my daughter being dead. I can't move on from her. Despite everything I have in my life, and the joy that surrounds so much of what we do with Alexander, part of my existence is stuck, there in June 2010, where she is. When I had her, held her, when she was real; not the photographs, rituals and headstone she is now. I haven't been to counselling since Anabelle's first birthday. I sort of stopped going without meaning to stop. I cancelled one week because of illness and just never rebooked another one. I didn't quite mean not to go again, my counsellor text a few times to remind me she was there; I'm not sure why I didn't book another appointment, I wasn't better. But then a few weeks past and it felt harder to ring and make an appointment. Then I got more and more pregnant with Xander, ended up in hospital at 32 weeks, and then the daily hospital visits just to keep me half sane until he was born took over. Then he was born, screaming, and my dream of being an earth Mummy took over, on a high as it were, completely immersed in Xander and everything that he is. Counselling was forgotten. I figured I was doing ok without it anyway. But now we're not so sure. I'm struggling to balance the absolute joy of being a rainbow Mummy to Alexnder with the despair of being an angel Mummy to Anabelle. I'm so desperately missing my girl, my pain and fear for the future and what forever means is putting enormous pressure on my family. Eighteen months since my last appointment I might have to pluck the courage up to go again. To make that phonecall, to make an appointment, to talk about these last eighteen months and what I'm not coping with right now. Maybe this is going to have to be my new years resolution 2013. The circular pattern, once again we're in phase angry. This last month or so I've been so angry, on and off, when I'm not being distracted by festive build up, when I have too much time to think, or triggered by something. Physically hurting painful grief. Feeling emotionally fragile. It is never going to end is it and I'm so tired of hurting. Once again the 'foreverness' is overwhelming. I don't know how to accept that this life is the way it is always going to be. One of our babies forever missing from our lives. I don't know how to accept how it is, over how it should have been. I don't know how to stop being angry. Angry that instead of having a world full of pink, like an average family with daughters, my daughter is dead and pink for us means grave decorations or symbolic gestures of remembrance in our home. Seemingly at the moment I'm coping less and less with this. Our version of having a daughter while watching most other families version of having a daughter. Our version of pink is becoming a fine line between being all I can do to include Anabelle in our family to feeling ridiculous because she isn't here, so what does it matter anyway? A fine line between our version of pink feeling like something I have to do or feeling completely meaningless and silly apart from being a ritual. A fine line between helping me cope or hurting me more. I know it sounds like I'm whining, but it isn't fair. I should be buying my almost two and half year old baby girl dolls and prams, toy kitchens and special dresses for Christmas, not have to steel myself in imaginary armour to buy for other people's daughters while having to buy angel decorations, pink trees, tinsel and lights just to somehow include my own in the festivities. What did we do to deserve this version of our lives? Why couldn't our family have been 'normal' like most others? I don't know how to be a bereaved parent forever, reaching this point again and again with the circular pattern of hurt and grief. Don't scratch me too deeply at the moment, believe me I'm outwardly being brave so often, but underneath there is too much going on leaving me feeling vulnerable to a very public outpouring of hurt before long. A fellow bereaved Mum wrote this as her status update yesterday. A poem about 'being normal', whatever that is. The normal that is different for us now, on weeks when I feel like this is, it is the normal that is complex. Mind in a whirlwind, not able to make sense of the intertwining strands of our lives. Complex, confusing, bewildering, exhausting. That's it. This week I'm tired, tired of carrying the weight of grief. Relentless, desperate, life-time lasting pain. I miss her. I miss how my family should have been. This Mum aptly sums normal up for us; "normal is these extremes"
To not now be grieving, not cry any tears, to not feel ashamed of our anguish our pain! What can we do... how to react, Feel ready to move on, but then again how so? I will... never ...nor would I want ...or can ever be known as normal again. This year I have discovered that the fear of pregnancy extends way beyond myself. 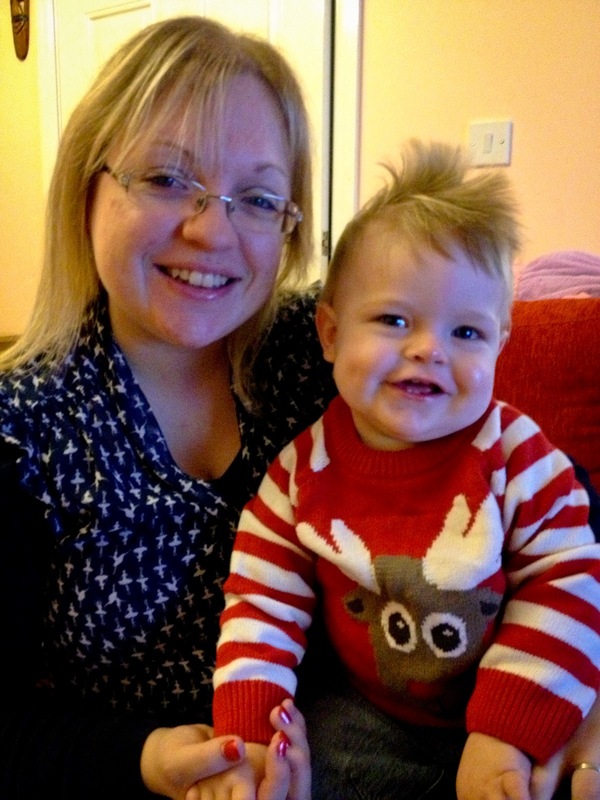 It wasn't enough to be fearful for my own baby, my own pregnancy. No, clearly I'm fearful for everyone else's too. Currently two good friends are pregnant and there isn't a day that goes by when I haven't thought about them, wondering how they are. Wanting to be involved but wanting to avoid it all at the same time. I'm anxious for them to get to the end, anxious for nothing to go wrong, just anxious for their babies to born safe and screaming. Over the coming months, years, I know there will be many more pregnancies. We're at 'that age'. I hate that naivety and innocence of pregnancy has been taken away from me. Instead of being able to fully join in the excitement for a family or friends pregnancy, there at the back of my mind is the anxious sick feeling. The fear. The fear of the pregnancy and then the fear of the baby when it gets here. I still haven't held another newborn that wasn't my own. I'm still not ready. I simply cannot face it yet. I dread being asked if I 'would like a hold?' I'm not entirely sure why, I know it isn't rational. I thought after Xander this fear would be erased, but apparently not. I know this is something I will have to make myself move past soon. And I will, one day. On my time, on my plan. And it will need a plan, a get out clause, an understanding audience that babies are a very mixed up emotion for me. I'm sure my friends will not mind me saying how nervous I am of meeting their newborns. A hurdle I have to get over twice before long, because I do want to meet their babies. Two and almost a half years on from our precious girl and I still cannot cope tremendously well with other peoples newborns. Silly? Maybe. Real? Yes. Baby girls especially. I only hope people understand, understand that I'm not bitter or twisted. Understand that my world is still broken, that it has been no time at all in the grand scheme of my life. For me, for us; pregnancy and tiny babies are forever changed. Please be patient, gentle and understanding with our family. 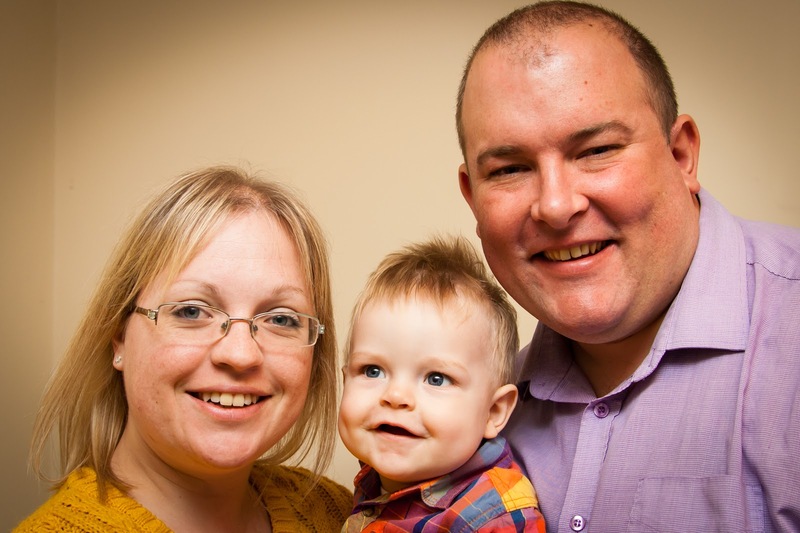 That is how a family's nightmare is described after their baby has died. Extremely difficult? It doesn't even come close. Doesn't do the hurt, despair, brokenness any justice. Our lives have become irreparable and to the outsider it is simply an extremely difficult time. When does it stop being an extremely difficult time? Never. Things change, differing periods of crushing hurt. But the extremely difficult times, when they come, are forever. Last week in Gwent, another family's experience was described as an extremely difficult time. 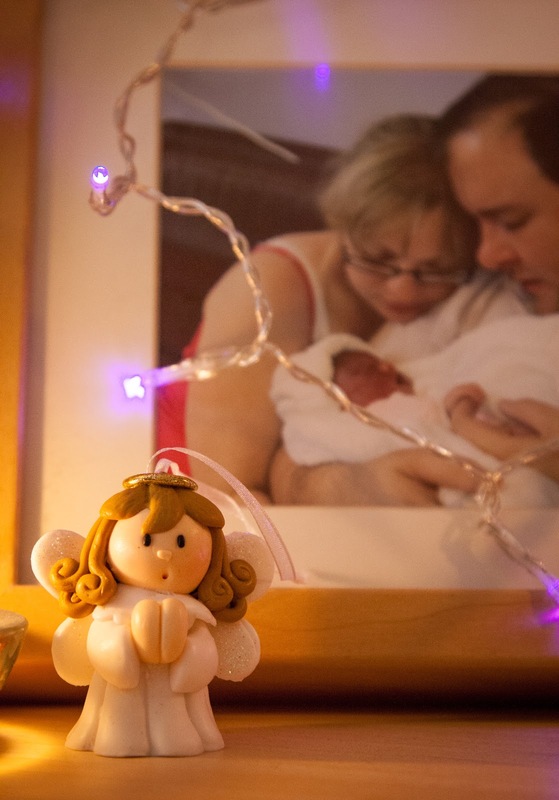 A baby died during birth because there was a two hour wait for an ambulance. An ambulance that was needed to transfer the mother and baby from the midwife led unit (MLU) to a hospital that had Doctors and facilities available to cater for emergency birth situations. A hospital that regardless of ambulance wait was already a 30 minute or more journey from the MLU. MLU's scare me. In an ideal world we would all have terrific, romantic, empowering births. But we don't live in an ideal world. Our world is scary. I know most pregnancies and births are trouble free, I know most births do not need intervention and I'm fully aware that my experience of pregnancy and birth has left me skewed. But, when a situation arises that a midwife is no longer equipped or qualified to deal with, and they often do; I personally feel Doctors should be there somewhere. Should be available on site. I'm hugely aware even with Doctors, things can still go wrong. But if an emergency is identified; a Doctor, a theatre should be there already. Babies lives are too precious. Not 30 minutes or more away. 30 precious or more wasted minutes away. Nevermind the additional ambulance wait in this case. I know many won't agree with me. I know there is a whole movement to de-medicalise pregnancy and birth. On one hand I understand the reasoning behind it; giving the power back to the mother, power back to nature for the low-risk birth. But then again, I hear you say my appreciation of risk value is skewed too. My 1 in 200 chance of my baby not coming home was a low-risk. Or at least it sounds fairly low until you are that one. It isn't great odds really is it. How do you really identify who will have a low-risk birth? How on earth does anyone really know how it will go until they are in the throws of labour? Even with the best will in the world, the most comprehensive birth plans, antenatal classes designed for stress-free births and whatnot, childbirth in reality is a risky individual unknown entity. So on the other hand I don't understand it at all; the rate of infant and maternal death during chlidbirth can only have gone down in recent decades because of the skills of our Doctors, the facilities that are available to us. Why would you not want to take advantage of that? Maybe it is because as a nation we have become blasé about the risks of childbirth. We don't expect babies (or mothers) to die, so we forget that they can and actually do. Although a significant factor, I would argue that baby died not only because of the ambulance wait. That baby died because a Doctor and emergency facilities were not available as soon as an emergency was identified. Even if there has been an ambulance straight away; there still would've been a long blue light journey to get to a Doctor for that baby. Maybe if the MLU had Doctor-led facilities across a corridor, instead of in a different hospital, that baby would've survived. What an unnecessary death. Another broken family. Experiencing the death of your child alters everything; it fundamentally changes who you are. Sometimes I still don't quite know who I am any more. Who am I? I don't recognise me, and the bits I do recognise I don't always like. 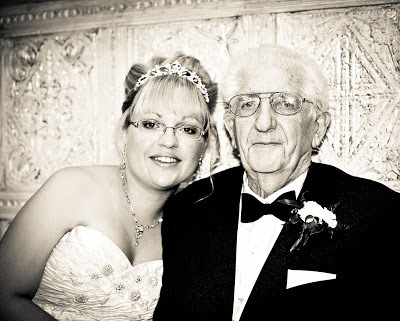 Sunday morning, 21st October 2012, my maternal grandfather died. He was 89 years old, had myleloma (a type of cancer of the blood), a huge aneurysm in his stomach and dementia. Over the last four years since being diagnosed with the myleloma he had had multiple infections and illnesses, and long hospital stays because of his impaired immune system. It wasn't the cancer or a burst aneurysm that killed him, that was threatening to kill him for so long, but a chest infection. He died at around 10.00am Sunday morning after surviving Doctors predictions and expectations time and again over the last four years. I wonder if he knew it was happening? I am ashamed to say that although I am sad, especially for my Mum who has lost her remaining parent (my Nana, her mother, died twenty five years ago), I'm not feeling distraught. I'm sad, that is all. Shouldn't it be more? This is very different to how I felt when my paternal grandfather, Grandad, died very suddenly five years ago. Life was different then, I was different then. I knew little of death then. I know too much now. I'm ashamed that I hadn't seen Grancha for months, I should have gone more often. Although I am pleased that he had at least met Alexander. I know that hospital visit had been a boost for him and he'd enjoyed meeting his great-grandson. I'm ashamed that I struggled with Grancha's illness since Anabelle died. I've struggled with what he has represented to me. Not him personally; but a world where sick old people stay alive while my baby daughter died. That isn't the way it is supposed to be. I struggle to accept our reality. And there is that bit of me I don't like; the hurting, horrible girl who resents other people. Another family death, planning another funeral, is making me relive that week of our lives. 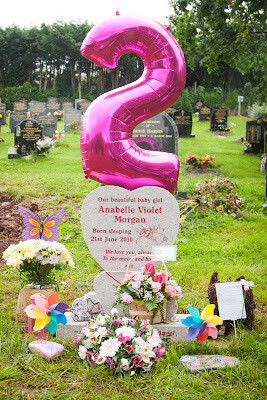 That week from Anabelle's birth until we said goodbye. Sitting there in my parents living room, talking with another funeral director, talking of coffins and flowers and services has brought it all back as if its happening again to me now. Isn't that incredibly selfish? Instead of being distraught for my grandfather I am grieving my baby girl and the injustice of it all. Today I've cried for Anabelle. Cried for the life we don't have and the regrets that remain. I cried because I so desperately want to kiss her one more time and wish I had turned around one more time in the funeral home and held her in my arms. I cried because my arms ache for her, my baby girl. I cried because I didn't put socks on her to keep her feet warm. I cried because I didn't take a photo of her coffin and the inscription of her name on it. I cried because she was placed in that deep dark ground before I'd touched her coffin one last time. All the things I can't do or undo. I cried because she was taken away from me, from us, far too soon. I cried because my Grancha's death is impacting on me in all the wrong ways. Me and Grancha on my wedding day, 1st August 2009. It really was. Exactly what we had wanted for him. A weekend full of treats, fun and laughter surrounded by all our closest family and friends. A very different kind of first birthday but in many ways the same as his sisters; the very best we could do for Anabelle and the very best we could do for him. Now at a one year, one week and one day old I'm finally getting around to doing his birthday and 12 month post! Xander had a wonderful rainbow Waybuloo party day! Rainbow paper, rainbow foods, rainbow presents and a sensory Nara land with the Piplings to play in all afternoon! One of my favourite presents! Alexander's growth has slowed down a lot, infact he has lost weight over the last month; 7oz! So at a year old Alexander weighs 22lb 7oz after being born at 8lb 13oz, an entire weight gain this year of 14lb 10oz! 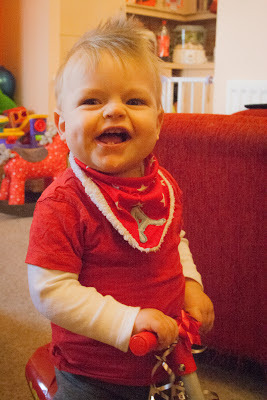 He is still firmly in his 9-12 month clothes currently. The health visitor wasn't at all concerned about the 7oz loss and put the loss down to the busy little boy he has become. Now Alexander can crawl he is constantly on the go. I really don't think he sits still for more than a minute at a time and even then his arms are busy doing something! 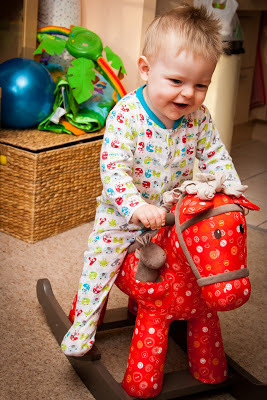 Not to mention the speed at which he can cruise around the furniture now; he spends all day getting up and down! At a year old, Alexander still only has 3 teeth. The third popping through just days before his birthday. The 4th and possibly 5th are very close on the horizon if his gums are anything to go by though. His play skills are becoming more refined all the time. Xander is becoming very quick to catch onto the concepts of a toy now. For example, he was given a car garage toy for his birthday, with a lift to pull up and push down, he was only shown once and he's remembered what he has to try and do, although it stiff for him to do on his own at the moment. He also had a hammer the shapes through the holes thing and it is very entertaining to watch him tap and hammer the shape after being shown what to do. 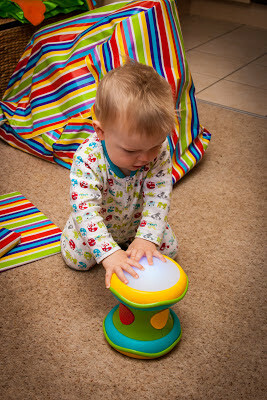 Xander is starting to play 'properly', exploring, learning. I tell you what though, I dread to think what his 'terrible two's' tantrums will be like if the strops he has now are anything to go by! Yes, already we have the proper arching back strops while telling me off very loudly. This usually involves going in the pram or car seat when he does not want to, food being finished or what he hates even more; getting dressed. Xander has decided he absolutely hates getting dressed and a strop is almost guaranteed! I'm sure he would happily never get changed or indeed just stay naked if I would let him! He has such a gorgeous little personality now, even with the twice daily strops getting dressed! hehe! He is endearing, happy, mischievous, cheeky, loving, funny and playful, and so much more! I think our boy is so busy learning new things he has forgotten how to sleep. Full nights sleep this last months have become very few and far between! My good little sleeper that emerged so early on had lulled us into a false sense of security! Now we seem to be regularly up with him two or even three times a night. I believe there is a degree of separation anxiety responsible for this, along with the usual teeth troubles and just being such a busy learner. Alexander has had a lot of change over the last month; he has had to get used to a new routine, one that involves not seeing me for a great length of time for three days a week, he has had to get used to new people starting nursery, he has learnt how to crawl properly and cruise properly, now he is learning how to balance ready to walk. It is no wonder he is feeling a little unsettled and looking for reassurance through the night! It does make for one very tired Mummy and Daddy though. He is just wonderful. Could I beam anymore?! This little boy who turned our world upside down yet a bit back together again. This little boy who has allowed us to heal a little bit, smothered in all the love I have for him and his sister, yet still feeling I could burst! Absolutely the meaning of rainbow; filling our world with colour through the storm, biblically a promise. Our promise of new brightness in our world. Our rainbow. Happy birthday precious boy! We're so looking forward to enjoying your second year with you! I realise I never finished the A-Z blog challenge in April, but thought now was as good as time as any to have a go at finishing it! So this time last year I was about to turn 36 week pregnant with Xander, I was a few days away from being admitted to hospital to be induced. All I could think about was getting him out alive; it felt so close yet still so far. I remember manically monitoring his every movement sick with worry that on this final stretch he would be taken away from me. And now, next Sunday, Alexander will turn one! This year has passed in a blink of an eye and this is what a first birthday build up should be all about, reminiscing for the right reasons, overwhelmed for the right reasons. 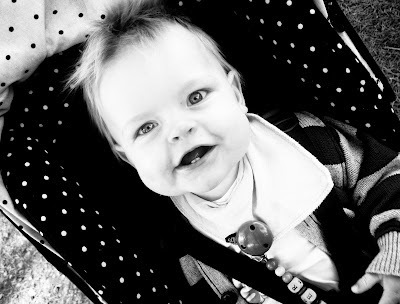 I keep staring at my boy is awe, my beautiful very nearly one year old boy! It is amazing, I cannot remember what out lives were like before we were parents; angel parents or here on earth parents. My children have become all I know. To help me through, reality. How would they have been alike? How would they have been different? Anabelle and Alexander. I'm finding myself wondering that a lot at the moment. Alexander has such a gorgeous cheeky personality, I laugh with him all the time. Would Anabelle have been the same? Happy? Always a pleasure like her brother? I enjoy Alexander so much; I hurt that my enjoyment of Anabelle was taken away. Would Anabelle have looked like Alexander, him like her? Would people have instantly known they were brother and sister if they were together? Alexander has changed so much; his hair was dark and spiky when he was born and after it all fell out when he was 4 months old it grew back blonde. Would Anabelle have been blonde too? I could really see the similarities when he was born. 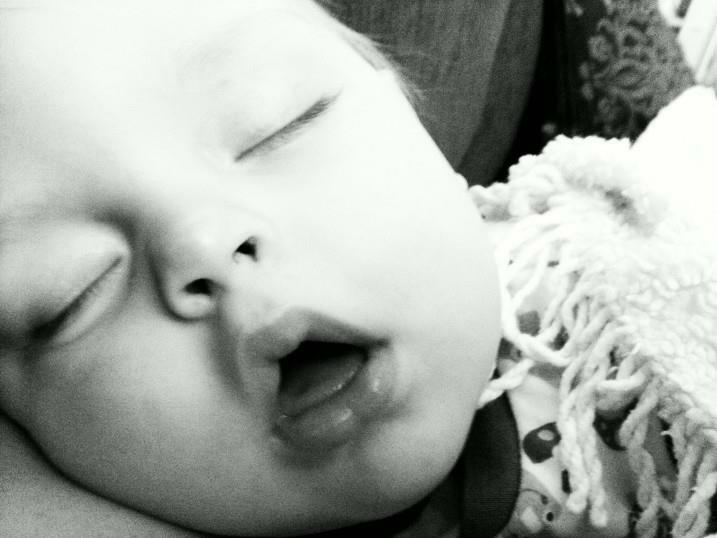 And when he sleeps he still looks so much like her, with his little open mouth and peaceful expression. Their chins and jawline have the same shape, their eyes, forehead and bridge of nose have the same shape. Sometimes I watch him sleep and do a double take and can almost see his sister. I like that I can see her in him, but I worry as he grows more and more that similarity will be lost. When he stops being a baby, that won't be long. We only briefly knew Anabelle as a newborn, a sleeping newborn. We have no way of knowing what she would've looked like at 11 months, we and she didn't get that chance. Does he represent what she would've been like too? I deserve to have my children together, watching their sibling bonds; not just hurting here trying to imagine it. I miss her. I miss her for us, for Xander. He would've loved his sister. A year ago today I was blogging from my hospital bed. 32+4 weeks pregnant with Alexander, the day of pregnancy his sister had died, and there I was in hospital terrified he was about to die too. I had threatened premature labour with him at almost exactly the same point as I had with Anabelle. To this day I can't shift the feeling this episode in hospital with her was a warning sign we should've heeded; a week later she died, so to have found myself in the same position with Alexander was terrifying. There started a week long stay and then daily visits to the hospital, the longest four weeks ever. But at the end of it, he came home. And now, a year on from that blog he is 11 months old! One month until the big ONE! This month Xander has made huge huge leaps! All the skills that have been emerging for a long time he is now mastering. He suddenly seems very grown up! Our wonderful big boy is pulling himself to standing, trying to cruise along the sofa, taking a few steps with his baby vtech walker, climbing over everything and everyone, crawling properly and generally becoming a delightful busy menace! I love it! My heart swells watching him navigate his way around the room, my clever clever baby! 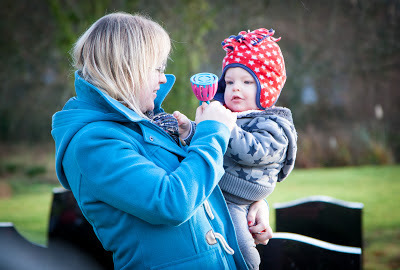 Another big moment this month was baby boy starting nursery. So far it seems he is settling into his bumblebee room very well. 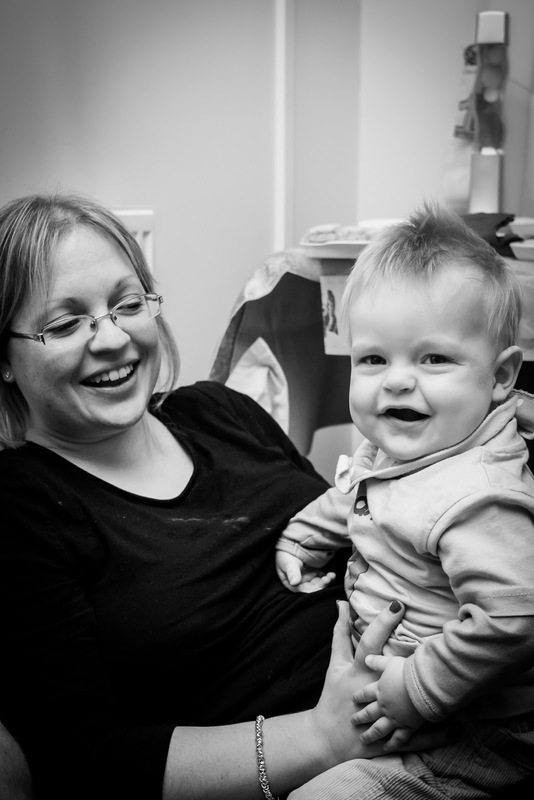 The reports nursery give us is that he is happy, inquisitive and playful while he is there and only a few tears. I feel so proud that they keep telling me what a lovely baby he is! They might say it to every parent of course, and I might be biased, but I have to say I agree! He is getting increasingly vocal but still no attempt at meaningful or recognisable words, just 'uh' vocalisations as if he's trying to talk to you or get your attention and some babble. We have lots of Dadadadadadada's for example, but not in context. In fact I'm still not sure he knows who we are by name. I often ask him where Daddy is and although he sometimes seems to look towards Daddy's direction I'm not confident that it isn't a fluke when he does so. When can we expect our first Muma and Dada in context? I can't wait for him to turn to me and say Muma! That really will make my day. He's more likely to identify Fiz I reckon! hehe. Fiz and Xander's budding friendship is ever growing. He loves her, gets so excited when she comes into his line of vision; cue lots of smiles, laughing, squeals, excited little legs. I think he is starting to get the concept of 'gentle hands' (well with lots of guidance!) and she loves the smoothing attention from him. Fiz loves him to, I'm convinced! She makes a point of curling up next to him most mornings now and letting him do his rough smooths! Adorable. Xander still loves his food, I still can't get it into him quick enough some days. Although dare I say it? He does seem to be calming down on the 'end of the world' crying when meal times are finished now! He has become proficient with soft finger foods now, looking back at all my worrying a few months ago and now he has a good go at everything you give him. My confidence is much better now and so is his; Xander has definitely finished with smooth purées, now he has a mashed/chopped dinner and eats a range of finger foods. Hand him half a banana, toast, pancakes, etc and he'll devour it with absolutely no issue! Even though at 11 months he still only has two teeth! Our growing boy is 22lb 14oz at 11 months old and has just moved into his big boy car seat. Another milestone moving from the baby carrier into a Group 1 seat! A few weeks ago I would've said he would be in his carrier until his birthday, he had plenty of room left in it and then all of a sudden over a few days he was too tall and I felt he would be safer in the new chair. He looks so small in the new chair compared to his carrier, but comfortable and cocooned too! And that is it. 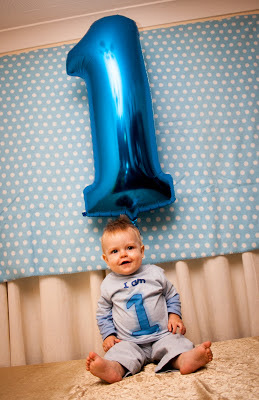 My next update will be his birthday update, his 'I'm a big one year old' update! This time last year we were in a very scary place, still not daring to believe this wonderful boy would stay with us, feeling fragile that he would be joining his sister. I'm feeling particularly emotional at the moment that we have been blessed with him, that he came home and is such an absolute joy. Truly our rainbow baby! Beautiful Alexander, you've given us colour back into our lives and so much more. Ah, another of those cross rambled blog posts. I seem to be doing a lot of those these days. Sometimes I read of the experiences of other bereaved parents and I am astounded. You know, the 'Don't have a clues' (DHACs) they encounter. I've written about DHACs before. Over these last 2 years and almost 3 months we've encountered our share of DHACs, been hurt by people we shouldn't have been hurt by. I know there are well-meaning but misguided DHACs, and then there are the other nasty kind of DHAC. Sometimes people are just so uncaring, flippantly unkind. But what is even more astounding is when these people are supposed to be the bereaved parents friend. Tonight, I've been reading about a bereaved Mum, who's angel sons third birthday is coming up. On his previous two birthdays her friends have rallied around when invited to help mark her son's day. 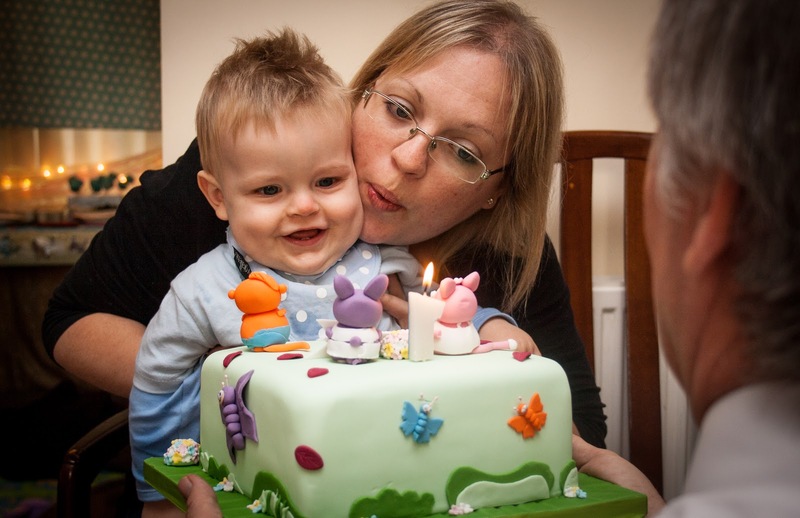 Joined her in a lunch in honour of her little boy to mark his birthday. Eaten, chatted, celebrated him, supported her. Friends going out for lunch for a child's birthday; not difficult huh? But apparently, this year, his 3rd birthday it is too difficult, too inconvenient. This Mum has noticed her friends are disinterested. Now one friend has phoned to say that she thinks it was time she let it go, that she can't let this keep haunting her forever. Basically that there is no need for a birthday lunch. There was more, but I don't think it is relevant after that point. Let it go? Can't haunt her forever? 'It' being her son of course. Time to let her son go? This person is no 'friend' to this lady at all. It makes me furious that anyone thinks it is their right to imply our dead children should be 'let go', that we should 'move on', tell us enough of remembering your dead child now, tell us how we should be behaving or grieving or whatever. Is it time for me to publish my Wish List again? Hello DHAC. You really don't do you. So tell me which of your children would you like to discount from your daily concerns today as you think we should so readily do? What a ridiculous thing that would be considered to say to me, about my living child. Ridiculous to say to me about my dead child too. What because its been 3 years we should forget now? Maybe you don't think we hurt as much any more, or if you think we do, maybe you think it was about time we stopped hurting. Do you forget one of your children's birthdays? No? Then why should we forget one of ours? Do you have your close friends part of your children's birthdays? Yes? Then why shouldn't we have our close friends around at our children's birthdays? Isn't that what supportive true friends do? If we invited you to our living child's birthday celebration would you come? Probably. So why not come along if we invite you to our angel baby's birthday celebration too? Is a meal, or a balloon release or anything really that inconvenient? Because it makes you feel uncomfortable? Why? And frankly, tough. Real friends put up with a moments discomfort to show love and compassion for a friend in need. Is it really so unreasonable to ask your close friends to join you in a birthday lunch for your angel baby son (or daughter)? If that is what it take to help you get through the day? Is it unreasonable to ask your friends to acknowledge all your children's birthdays, living or otherwise, like they would acknowledge all of yours? Can you imagine your friends remembering one child but completely ignoring the other? Would you think that acceptable? No? Then I don't for my children either. We've been so incredibly lucky in our friendships. We have always felt able to be open about Belle as a member of our family, not once have our friends made us feel like we should shy away from her name, or not to talk about her. I talk about Anabelle with my friends regularly, there isn't a day that goes by without her coming up in a conversation somewhere. Our friends have remembered her 'remember day', remembered her birthdays, we've had friends make the effort to travel and visit her garden to leave their own floral tributes on her birthday, given us memory gifts, pass things to us for her to take with us, sent cards to us to tell us they are thinking of her, invited us out for a meal to mark her birthday. We have friends who have remembered her and honoured her in their weddings. We have friends who 'get it' as much as they can do and for that we are blessed. I hope (and I'm sure it won't) that doesn't change because it's her third birthday, or fourth birthday or whatever birthday when June rolls around again each year. I'm already anxious of Anabelle's third birthday. I know it is nine months away, but living without her doesn't only happen to me in June, it happen's all year around. For her third birthday I know it already falls on a work day; I already worry how on earth I'm going to cope in work. For her third birthday I worry people will expect me to be better. And it won't be better. There'll be another lantern, another decorated grave, another balloon into the sky, another cake. Another year of birthday rituals because she turns three but won't all at the same time. Another year of living without her again, until the next birthday and so on and so forth, forever. Same for this lady on MN too. There is no better, there is forever, but to quote the Beatles; there is getting by with a little help from your friends (and family).